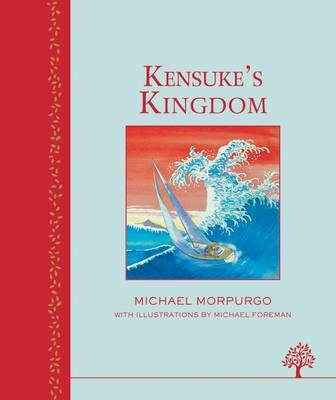 Kensuke's Kingdom is a true children's classic by former Children's Laureate Michael Morpurgo, the creator of War Horse. I heard the wind above me in the sails. I remember thinking, this is silly, you haven't got your safety harness on, you haven't got your lifejacket on. You shouldn't be doing this...I was in the cold of the sea before I could even open my mouth to scream. Washed up on an island in the Pacific, Michael struggles to survive on his own. With no food and no water, he curls up to die. When he wakes, there is a plate beside him of fish, of fruit, and a bowl of fresh water. He is not alone...From the author of War Horse, Private Peaceful, An Eagle in the Snow, Listen to the Moon, and I Believe in Unicorns comes a stunning children's story - loved by kids, teachers and parents alike. Michael Morpurgo has written more than one hundred books and won the Whitbread Award, the Smarties Award, the Circle of Gold Award, the Children's Book Award and has been short-listed for the Carnegie Medal four times. Reviewed as 'A dazzling adventure' by The Times. Washed up on an island in the Pacific, Michael struggles to survive on his own. With no food and no water, he curls up to die. When he wakes, there is a plate beside him of fish, of fruit, and a bowl of fresh water. He is not alone...From the author of War Horse comes this tale of survival against all odds, set against the dramatic backdrop of the Pacific and recalling memories of the Second World War. This is a remarkable and unforgettable story. As ever, Morpurgo doesn't fail to satisfy. An adventurous tale that all of my students love. A timeless read that can be read over and over. This really is essential reading for any children's holiday.